A predicted result of climate change is increasing forest fires, thanks to dried out vegetation acting like tinder. As I write this California has several massive wildfires - the Camp Fire just destroyed the entire city of Paradise California, and a pair of wildfires are threatening to destroy Malibu and/or Thousand Oaks. But that&apos;s not the only tragedy, because the smoke travels and creates unhealthy air conditions a hundred miles away or more. If you can see the air, and smell the smoke, just how bad is it for your lungs and health? I live in Santa Clara, CA, about 150 miles from the Camp Fire. This forest fire broke out on November 8, 2018 and quickly burned over 100,000 acres of land, and destroyed the entire town of Paradise California. For the last week since the fire broke out our air has gotten progressively worse. The readings above are the worst I&apos;ve seen so far, and according to an air quality monitoring website the next few days will be even worse. Indoors air is rated as unhealthy for those sensitive to pollution and outside air rated as flatly unhealthy. It&apos;s now evening, and according to my handheld air quality monitor the air has gotten a lot worse. Indoors air is at about 180 PM2.5 (Unhealthy) and outdoors air is above 400 (Hazardous). Haze is visible when looking at trees just 10 feet away, and car headlights look like they&apos;re shining through fog. The question is - if there&apos;s a fire nearby, how do you know whether your air is healthy or not? How do you know when to curtail outdoors activities because of unhealthy air? A news article today asked about those whose job is outdoors, like construction workers, and just how unhealthy is it for them to continue working in these conditions. According to the hand-held air quality monitoring gadget I own, see the image above, the air inside my house is at the bottom end of the unhealthy range, and outdoors the air is squarely in the seriously unhealthy range. That&apos;s 150 miles from the fire, and according to the air quality monitoring website the air in some locales nearer the fire is in the "hazardous" range. 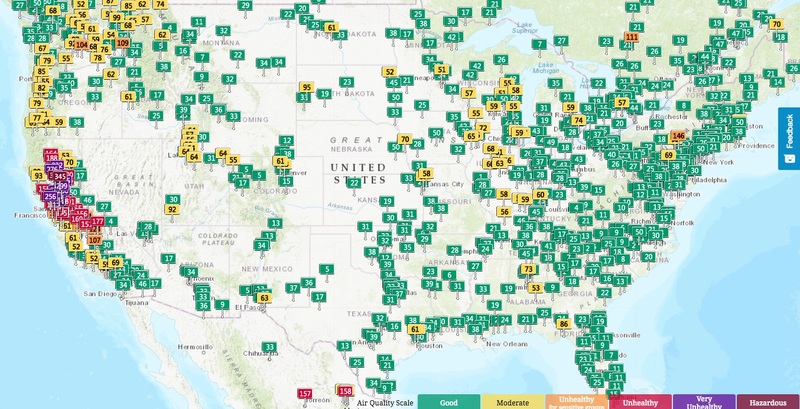 That&apos;s air quality measures across the USA. Notice how California&apos;s Central Valley and the SF Bay Area have air quality readings much worse than the rest of the country? That&apos;s due to the aforementioned Camp Fire. Climate scientists have warned us for years about how the warming climate will cause a range of disasters, including more frequent extreme wildfires. Even though we&apos;re warned to not do this: It is fair to attribute these fires to climate change. For the last several years California has had dry year after dry year -- meaning little rainfall. Additionally the weather is hotter and hotter every year. That&apos;s left California&apos;s mountains full of very dry vegetation that&apos;s ready to burn like tinder. All it took was a downed power line to ignite the fire, and 50+ miles/hr winds blowing from the east to propel the fire into Paradise, CA. If predictions by climate scientists are correct - as the climate continues to warn we will have more such events. Which gets to the question of how do we cope if there is going to be an increase in wildfires? One step to take is for those who live in forested areas to learn wildfire safety tips. For example to keep brush cleared from near the house, use fire resistant materials in the house, and so on. Or for such people to move away from the forest. The rest of us, who live nearby, we must recognize the likelihood of repeated massive fires nearby. We must learn how to cope with air that has suddenly become unhealthy? The most important step is being informed. It&apos;s one thing to be able to see the air -- the air should never be like that -- but it&apos;s yet another thing to know if the air is unhealthy. What if it&apos;s just mist or fog? The websites just mention give maps with numbers showing the air quality in a given area. What do those numbers mean? Moderate AQI is 51 to 100. Air quality is acceptable; however, for some pollutants there may be a moderate health concern for a very small number of people. For example, people who are unusually sensitive to ozone may experience respiratory symptoms. Unhealthy for Sensitive Groups AQI is 101 to 150. Although general public is not likely to be affected at this AQI range, people with lung disease, older adults and children are at a greater risk from exposure to ozone, whereas persons with heart and lung disease, older adults and children are at greater risk from the presence of particles in the air. 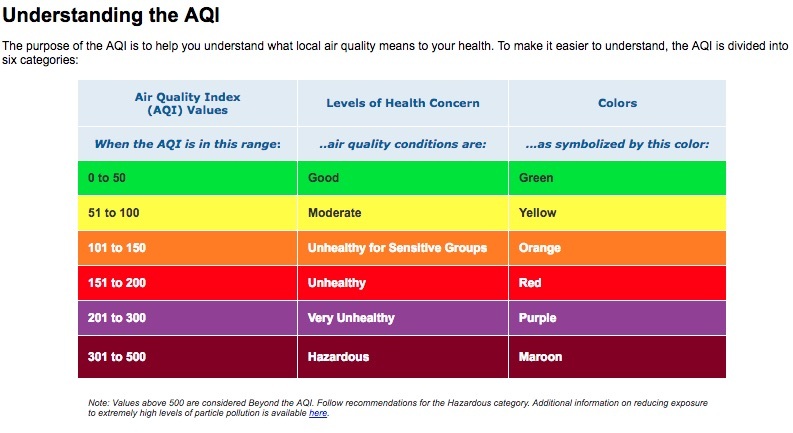 Hazardous AQI greater than 300. This would trigger a health warnings of emergency conditions. The entire population is more likely to be affected. A very convenient hand-held gadget for measuring several air quality factors including air pollution level, HCHO, TVOC, PM1.0/PM2.5/PM10, temperature and humidity. A very convenient hand-held gadget for measuring several air quality factors including HCHO, PM2.5, PM10, AQI, Temperature, Humidity, TVOC. Air quality monitoring in your cell phone. The sensor is located in a small box that is clipped to your clothing. An app running in your cell phone queries the sensor, displaying and recording data.